Welcome home! 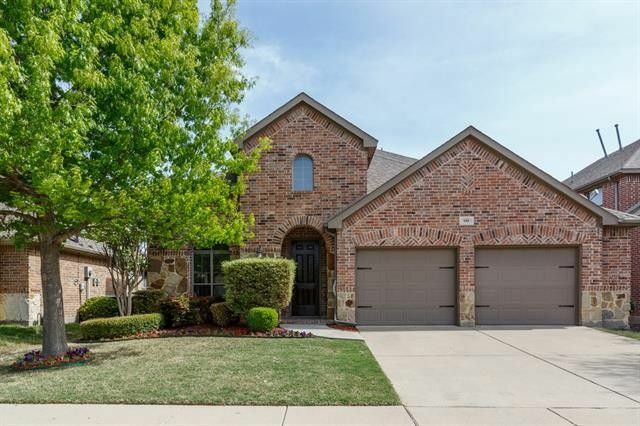 This gorgeous home is located on a beautifully landscaped lot on the Rockwall ISD side of the highly desirable Master Planned community of Woodcreek. The architectural elegance of the home is apparent the moment you enter the Foyer which showcases a wrought iron staircase and soaring 2-story ceiling. The Formal Dining Room with an oil-rubbed bronze chandelier would also make a handsome Study. The open Kitchen offers an abundance of richly stained cabinetry, granite counters, tile back splash, 4-burner gas range and pantry. There is also a Butler’s Pantry with a granite counter top for additional storage. The light and bright Breakfast Nook has a door leading to the covered back patio. The Family Room features a stunning stone fireplace with a gas starter and wall of windows overlooking the backyard. The secluded Master Suite boasts a luxurious bath with separate vanities, jetted tub, tiled shower and large walk-in closet. There is also a second downstairs bedroom with a full bath. Upstairs offers a spacious Game Room with a convenient storage closet, true Media Room which is wired for surround sound and 2 secondary bedrooms which share a nicely appointed Jack & Jill bath. The oversized garage contains a workbench, storage cabinets and garage door opener. Exterior amenities include a covered patio with extended pad, sprinkler system and gutters. Woodcreek offers a clubhouse with fitness center, pool, splash park, dog park, multiple playgrounds, bike/hike trails, sport fields, stocked pond and 2 onsite elementary schools. The neighborhood has easy access to SH-66 and I-30 for your commute. Directions: I-30, North on John King Blvd (exit FM-3549 is closed), Right on Hwy 66, Left on Woodcreek Blvd, Right on CD Boren, Right on Hampton, Home on Left. You can also take I-30 to FM-551 North, Left on Fate Main, Left on Ruffian, Right on Hampton, Home on Right.